Netminder Don Beaupre enjoyed a solid NHL career that spanned parts of 17 NHL seasons. He was known for cutting down the angles well and utilizing a cat-like glove hand. The native of Waterloo, Ontario starred for the OHA's Sudbury Wolves. In 1979-80 he won 28 games and was named to the league's first all-star team. As one of the top rated goalies in the 1980 Entry Draft, Beaupre didn't last very long and was claimed 37th overall by the Minnesota North Stars. He enjoyed a solid training camp and ended up splitting the goalkeeping chores with veteran Gilles Meloche. Beaupre won 18 games in the regular season, participated in the All-Star Game, and played 14 post-season matches when the Stars reached the Stanley Cup finals. The young netminder's star did not shine as brightly over the next three years, but he still managed to make 98 appearances. 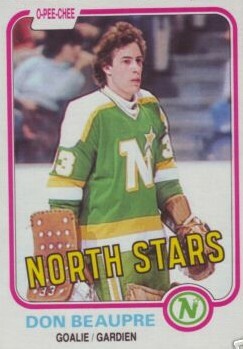 In 1983-84 he backstopped Minnesota to an appearance in the semi-finals and played 25 games two years later. By 1988-89, the team declined and Jon Casey played most of the games. Beaupre was traded to the Washington Capitals early that season and played a handful of games for them before being sent down to the AHL. His career was rejuvenated in 1989-90 when he won 23 games in 48 appearances and helped the Caps reach the semi-finals for the first time in franchise history. Beaupre continued to play well and benefit from Washington's solid defence in the early 1990s. He led the NHL with five shutouts in 1990-91 then won a career-high 29 games the next year. 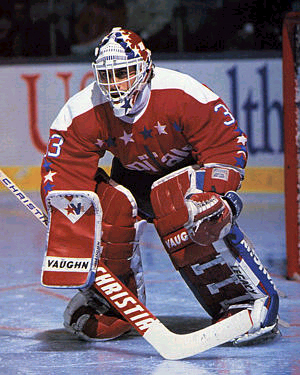 By the mid-'90s, the Capitals were looking to Olaf Kolzig to lead them in goal. Beaupre was shipped to the weak Ottawa Senators where he saw plenty of rubber in 71 games over two seasons. By the time he was traded to Toronto in 1995-96, the veteran's reflexes and confidence were eroded. He retired in 1997 after spending most of the season with St. John's of the AHL.